You can pay for traffic and wait for word-of-mouth to bring visitors in or you can take advantage of the millions and millions of daily searches on Google, Bing, & Yahoo. SEO or search engine optimization can help you do just that, get started with SEO Tutor today. 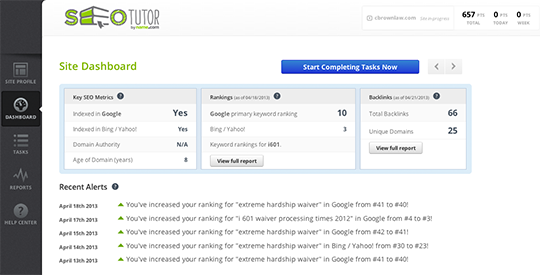 SEO Tutor guides you step-by-step through improving your site's search engine ranking. SEO Tutor is SEO Software that was designed by pioneers in the search engine optimization industry as a one stop shop for you to optimize your site and gain a broad SEO education in easy, bite-sized steps. SEO Tutor web-based solution helps users understand SEO through a personalized SEO action plan and performance tracking reports to ultimately increase your site's reach and sales. Is my SEO Tutor action plan REALLY customized for MY website? Yes! 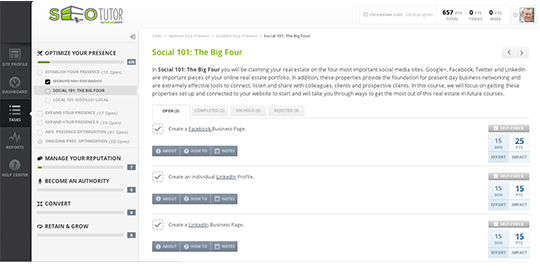 The system has been set up to fully customize tasks and recommendations based on your target keywords, business type, industry, and overall objectives. Do I need to be an SEO expert or web programmer to use SEO Tutor? No! The goal of SEO Tutor is to help you become an SEO expert. Any prior knowledge of SEO is a bonus! If you do run into any problems, an SEO expert or fellow user is always available to provide assistance. 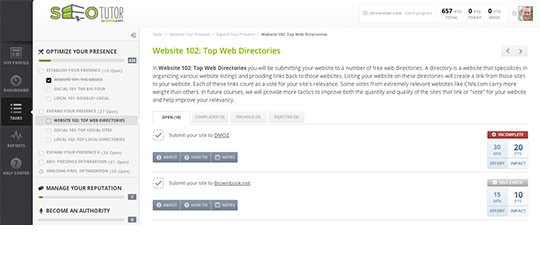 Do I need to know HTML to use SEO Tutor? No! The instructions to complete the various tasks are written so that anybody can follow along accordingly. Do I need to download anything to use SEO Tutor? No! SEO Tutor is web-based platform allowing you to access it anywhere at anytime. No updates or complicated installation processes required. Will doing SEO, or using SEO Tutor, get me in "trouble" with search engines like Google or Bing? No! SEO Tutor is completely "white-hat" which means it recommends tactics and tips that are fully endorsed by the search engines themselves. For more information on SEO Tutor Visit our knowledge base or call us at +1 720.249.2374.